For more resources, articles and study guides on prayer please check out the Prayer Ministries page under Equip. 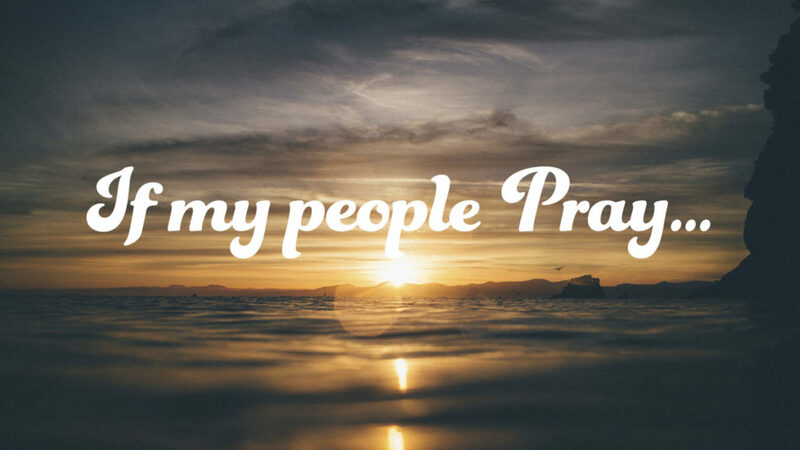 “If my people pray . . .” – 2 Chronicles 7:14. Think God won’t make a deal? He does! In the middle of the night, He comes to a king with the best deal in the world for the people of the kingdom. 2 Chronicles 7:14. Conditions: (1) Humble yourselves. (2) Seek my face in prayer. (3) Turn away from sin. Outcomes: (1) I will hear from Heaven. (2) I will forgive every sin. (3) I will restore your land and your life. It doesn’t get more clear than this. Or more simple. Or more powerful. Will you accept God’s deal? For your soul. For your life. For your church. For your nation. God’s deal is time-sensitive. It’s on the table now. From far South to far North, let’s accept Heaven’s prayer deal today! Question: When the Father sent His Son into the world, it was with a sublime promise. What promise was it? Success promised—on a single condition. “Ask.” Jesus’ mission did not run on auto-pilot. It was dependent. It was participative. It relied on trusting prayer. As the Son would pray, His mission would succeed. If prayer were to be neglected or eliminated—an unthinkable outcome. Massive wonder, when we do not. After decades of ministry and study, I can describe no fancy formula, powerful programme, or magic methodology. But I have seen churches transformed, revived, multiplied, and grown. In every case, the miracle began when leaders and members brought their sins to Jesus, confessed their need, surrendered their resistance to change, and together claimed the promise of the Spirit through prayer. “If you then, who are evil, know how to give good gifts to your children, how much more will the heavenly Father give the Holy Spirit to those who ask him!” Luke 11:13 (NRSV). Wait no longer. Even if you are one of only two or three in your congregation who feel desperately ready, you can act on God’s promise. Here’s one of the most powerful thoughts in the Bible. “Suppose two of you on earth agree about anything you ask for. My Father in heaven will do it for you. Where two or three people gather in my name, I am there with them.” Matthew 18:19-20 (NIRV). This is the “two or three” principle. Individual prayer is powerful. But double one with another to make two—or even better, add a third—and all Heaven breaks loose! Two points to note here. First, Jesus is talking about opening Heaven’s doors to people who need a Saviour. It’s not just prayer than unlocks, but combined prayer. There’s power in spiritual company. Second, when we pray, we must “agree”! The Bible word for “agree” comes from music—it’s the word for symphony. Creativity, beauty, balance, rhythm, variety, power. So in your church, why wait? Come together. Strike up a symphony of prayer for people who need Jesus. These days, it’s not difficult to set up a fellowship of prayer for your church, home group, Bible class, or other organisation. One of the most effective ways is through cell phone texting. Discover a creative name for the network. Find a fellow disciple to co-lead the process. Keep the network’s membership under 50, to avoid overload. Use the app called Groups—it works great (pay the tiny cost for the app’s enhancements). Encourage praises, as well as requests. Edit for brevity, spelling and clarity. Remember confidentiality, especially with medical matters. And include the Word of God whenever you can. Whether leading or participating, you’ll find this ministry a tremendous joy. Let’s guard our networks of prayer! Never compromise personal information—that’s one of the quickest ways to spoil integrity. First, if you’re asking for prayer, don’t go into much detail. Give just enough to provide a focus for the prayer request. Second, if you are on a prayer team or praying with someone else for a need, don’t turn it into a guessing or wondering game—pray exactly as you’ve been asked, and leave the details with God. Especially guard family, legal, and medical information. Anything you learn through the prayer team, keep private unless you know for sure it’s been publicly expressed by the person requesting. “Show proper respect to everyone. Love the family of believers.” 1 Peter 2:17 (NIRV). Who have you prayed for lately? Friends, family, other church members—for sure. But have you prayed lately for strangers? One survey indicated that among people who prayed, only about 3 per cent prayed for people they didn’t know. When Jesus prayed, he prayed for and wept over the lost of Jerusalem. Matthew 23:37. And in the greatest intercessory prayer in Scripture, Jesus said this: “My prayer is not for them alone [that is, for Christian followers]. I pray also for those who will believe in me through their message.” John 17:20 (NIV). The heart and mind of Jesus extended to the millions who did not know him. Are your prayers extending to those dying without Christ? Hudson Taylor took on the challenge of preaching Christ to the Chinese people—a quarter of the world’s population. When he arrived in China, there was one Protestant Christian for every one million people. Fifty years later, the ratio was one Protestant Christian for every 2,000 people. In the most unpromising circumstances, the Holy Spirit moved in a way seldom seen since Pentecost. This movement was driven by a single dynamic—the Gospel taken seriously, along with prayer, prayer, prayer! #9: Why doesn’t God answer? There’s no sin in this question. You’ll find something like it throughout the Bible, by people like Job, David, Jeremiah, and Daniel. There’s honesty and longing in your question, and it’s put there by the Holy Spirit. Here’s the most important thing that can be said—“Keep on praying. Don’t give up!” Jesus told a story to illustrate this advice, Luke 18:1–8. The best thing that comes out of Jesus’ story is that he understands your frustration. His sympathy is with you. He cares for you in your struggle. So keep on praying, no matter what. Soon, you will see beyond your present dark picture. You will see a beautiful, significant outcome—the results God finally brings about. James 5:11. “The LORD would speak to Moses face to face like one would speak to a friend. Then Moses would return to the camp.” Exodus 33:11 (NIRV). Here is one of the greatest descriptions of prayer in the Bible. Rather than trying to tell you what it means, I invite you to pause right now and do that for yourself! Ask God to interpret these words into your own life of prayer and ministry. Let the scene described here, between God and Moses, radically change your day, and your life. All prayer is ministry. And all ministry is prayer ministry. Think about this. We pray to bless ourselves. That’s fine, because the more we’re blessed, the more we can bless others. We also pray to bless others directly. In all our prayers, the goal is ministry—serving people for whom Christ died. After Moses talked with God face to face, “he returned to the camp”. Exodus 33:11. We cannot stay on the mountain—God calls us to return to the camp. Back into the everyday grind. Back to where God can use us significantly. As we pray, we minister. And as we minister, we pray. It’s a pleasure! Here’s a gem from an old history book. “God helped his people fight against the Hagrites and all who were helping them. He handed over all those enemies to his people. That’s because they cried out to him during the battle. He answered their prayers, because they trusted in him.” 1 Chronicles 5:20 (NIRV). Put yourself in this scene. Who are your enemies today? The devil? The world and its systems? Someone coming against you? Yourself? The remedy is provided. Cry out to God in your battle. Refuse to doubt—place your confidence in God. He will hear your prayers, help you fight, and give you the exact deliverance you need. “Pray without ceasing” and “Pray for all people, everywhere”. Good Bible counsels, but how can we stay focused, and keep from getting overloaded? It’s easier than it used to be! On your mobile phone or device, get the app called PrayerMate. Arrange your prayer needs and praises using your own customised sections and titles. If you wish, subscribe to one or two built-in prayer feeds, such as Global Prayer Digest or Open Doors. “Swipe left to pray.” Each morning, focus on whatever number of areas you specify; then see a fresh selection the next morning. My wife and I have been using PrayerMate for nearly a year—we love the way it guides our praying. One day a friend of mine put his arms around the shoulders of a couple of younger guys we were talking with and said, “Hey guys, I’d love to pray for you!” I was shocked. These younger guys were not believers. I thought they’d be offended. In the coming days, perhaps the Holy Spirit will lead you to pray in person for one or two people who’ve never been prayed for in their entire lives. Ezra is leading some people back to Jerusalem. Dangerous journey. He could ask for military protection, but he’s already told the king that God will be their Protector. So here is Ezra’s military strategy: “We didn’t eat anything. We prayed to our God about all these matters. And he answered our prayers.” Ezra 8:23 (NIRV). “We fasted, we prayed, and God answered.” It doesn’t get more simple than this. Any chance that together, we could actually come back to this strategy for personal life and church mission? “I’ll be praying for you.” This is a nice thing to say. It could make someone feel good. But deep down, we know this promise can be forgotten. So here’s a better way. Instead of saying you’ll pray in the future, pray for the person now! In person, on the spot, even in public. Who cares if others see it? Then, when the feared time arrives—a surgical procedure, a test undertaken, a job interview, or whatever—send an actual prayer that person’s way. Use email, a text message, a phone call, or a quick visit. Now that is praying for real. “Even when you ask, you don’t get it because your motives are all wrong—you want only what will give you pleasure.” James 4:3 (NLT). Other versions say “you ask amiss”. “Amiss” means selfishly, with poor intentions. When you ask God for something, why do you want what you want? To honour god? Or perhaps to escape challenge, avoid trust, or sidestep a call to service? To pray “Thy will be done”, in humble submission—this is prayer that really counts. Do you want Jesus for his own sake? Or do you want to get something out of Jesus, for your own sake? Each of us is called by the circumstances of our lives to face this challenging question. If you’re hurting right now, this one’s for you. “When I was really hurting, I prayed to the LORD. He answered my prayer, and took my worries away.” Psalm 118:5 (CEV). In a crisis, it’s important how we pray. Sometimes we turn our prayers into worries. Better to turn our worries into prayers. Twenty seconds—seems to be our tolerance for public prayer. Even then, our minds wander as we wait for the “Amen”. Has something diminished our delight for public prayer? The average psalm is nearly two minutes. Jesus’ priestly prayer was more than three minutes. King Solomon’s prayer was four-and-a-half minutes. People in Ezra’s time prayed a heartfelt prayer of more than seven minutes. This is not a plea for seven-minute prayers. Prayer can be short and beautiful—the Lord’s Prayer is a 20-second example. But could there be times when longer prayers might be beautiful, too? Whether 20 seconds or a minute or two, let’s make prayer a highlight in worship, rather than a dash toward “Amen”. It’s a dynamic from the Bible. We can be people of faith and prayer—but we can also crack the reins and see what the horse can do! In Nehemiah’s time, enemies came against the people. Their response? “We countered with prayer to our God and set a round-the-clock guard against them.” Nehemiah 4:9 (MSG). This was the right response. Not prayer or action, but prayer plus action. Marvellous! The other day I did something I should have done decades ago. I made my own selective list called “Promises—12 life-changing guarantees from God’s Word”. I began with Psalm 37:25 (provision), and finished with Revelation 3:11 (hope). The exercise was a big blessing. I keep this list on my phone device—always with me. So now, when I feel overwhelmed or discouraged, I go right to my personal promise list. I find the one that fits what I’m facing right then, and give that promise back to God in prayer. Talk about changing attitude in a moment! God “has given us great and precious promises” (see 2 Peter 1:3–4). Let’s treasure these, and see how they transform our praying. Now, start your promise list! What is intercessory prayer? It’s not a different kind of prayer—it’s prayer in action. To “intercede” means to put yourself into the challenges faced by others, then lift them up to God for his help and blessing. Most of our praying includes intercession. Christ is our ultimate intercessor—he prays for us, John 17:9–11. The Spirit of God also prays for us, Romans 8:26–27. People such as Moses, Daniel, Esther, and Nehemiah interceded for the people of their times. Let’s all be intercessors! Every day, it’s our privilege to take others by name, and lift them up for the blessing of Heaven. There are good people who are disheartened about prayer. They see others get answers, but not themselves. They hear talk about power, while they sense only weakness. Here we need to acknowledge the whole Bible, not just parts of it. Like this part: “My soul is very troubled. Lord, how long will it be until you save me? … My groaning has worn me out. All night long my tears flood my bed.… My God, my God, why have you deserted me?” This too is prayer—honest prayer, valid prayer, holy prayer. Sorrow is sacred. The saying, “Just have faith!” is an unwelcome intrusion. An arm around the shoulder, a sacred silence, and a tear shared in genuine connection—this is the presence of God for those who feel forsaken by the God they seek. Confession—a part of prayer that’s important, but do we know how to do it? “I’m sorry for my sins”—that’s avoidance, not confession. It’s like saying to someone you’ve hurt, “If I’ve offended you, I’m sorry.” We must name our offences, we must own them. Specific confession is necessary, and healthy. In a revival under Nehemiah, the people spent a quarter of a day confessing their sins to God. You’d have to be specific to fill that time! Can’t think of anything to confess? That might be the real problem. Ask the Holy Spirit to show you what needs confession in your life—ask him to be ruthless about it. Here’s the good news. “If we admit our sins—make a clean breast of them—he won’t let us down; he’ll be true to himself. He’ll forgive our sins and purge us of all wrongdoing.” 1 John 1:9 (MSG). Jonah. We think this Bible book is about a prophet and a whale. But the story is really about prayer. Sailors pray. Sailors pray again. Jonah prays. A pagan king prays. The king’s people pray. Jonah prays again, an angry prayer. And yet again, a desperate prayer. In Jonah, prayer is all over the place. Whoever’s praying and whatever kind of prayer is being prayed, God listens. He responds. He dialogues. Because of prayer, people get saved—sailors, a prophet, a king, and a city of more than 120,000 people. Ultimately, Jonah is not even really about prayer. What’s it about? It’s about God—the God who watches, listens, responds, and saves. Let’s have some good talks with this God! There are certainly people I pray for nearly every day. Some of them asked me five or 10 years ago to pray for them. Holy Spirit tells me not to stop, at least not yet. Others didn’t ask, but I’m praying for them anyway. Most of these people have no idea I’m in daily prayer for them. Or perhaps they do. I can guarantee someone is praying for you. “I am praying for you,” declares Jesus. See Luke 22:32; John 17:9, 20; Hebrews 7:25. Grab this picture—hang on to it. There are more people praying for you than you realise. Chief among them is Jesus. Imagine the power of his prayers for you. #27: Will you pray this prayer? “Get up, Lord; get angry! Stand up against the fury of my foes!” Psalm 7:6 (CEB). Ever taught this kind of prayer to your children? Thank God that prayer is not make-believe. It’s authentic, honest. If you feel a need for this kind of prayer—pray it. If you don’t need this kind of prayer for yourself, pray it for someone else. Become an intercessor. Pray for people devastated by abuse, crime, terrorism, or persecution. In your heart, enter their situation, and pray this prayer for them. When you read this kind of prayer in the Bible, consider your ultimate enemy. He has terrorised you, abused you. Pray this prayer in Jesus’ name against the false ruler of this world—and relish the victory Jesus gives. Children responded well to Jesus. Of all the holy people of his time, Jesus was the holiest. But he didn’t parade along the streets dressed in the formal robes of church leaders. And he didn’t ignore the kids, didn’t yell at them, didn’t talk down to them. He came to their level, and chatted with them. They chatted back. Conversation included stories and laughter, and sometimes tears—this was their language, and the language of Heaven. Here we see prayer at its finest—because what is everyday prayer, if it’s not conversation with Jesus? To the extent we’ve turned prayer into something else, it must be time to become children again. Matthew 18:1–5. “Pray for all people. Ask God to help and bless them. Give thanks for them. Pray for kings.” 1 Timothy 2:1–2 (NIRV). No-one has to tell us to pray for our loved ones. But here’s a challenge—choose a nation far away, and pray for it. First select a continent or world region—Europe, Asia, Africa, the Americas, Australasia. Then prayerfully select a country, district, or people group in the area of your choice. Put this on your regular list for intercession and thanksgiving. Learn about your selected nation. If you have children, involve them in this project of prayer. When you arrive in Heaven, imagine the stories Jesus will tell you, about the impact of your prayers in the nation of your choice. Here’s one of the saddest verses in the Old Testament. “I looked for someone among them who would stand up for Jerusalem. I tried to find someone who would pray to me for the land.… But I could not find anyone who would pray for it.” Ezekiel 22:30 (NIRV). This sad verse is good news, actually. We can turn things around by taking a stand. We can ask God for his blessing on our nation and our church. Then, sadness will move away and glory will take its place. Ready now? Let’s pray! “Love your enemies. Pray for those who hurt you.” Matthew 5:44 (NIRV). What a challenging command. When we’re terribly hurt by someone, the last thing we feel like doing is to love them and pray for them. But here’s the point. When Jesus tells us to love our enemies and pray for them, it’s largely for our sake. The alternative is bitterness and criticism—which poison our soul, stain our conscience, and jeopardise our health. When our bitterness turns to compassion and our criticism becomes prayer, it’s a miracle of health and healing. Love and pray. You cannot pray for someone, and hate that person at the same time. Prayer is a weapon of peace that might not change the other person right away, but it can change you right away. Seize the weapon! One of the holiest people in history knew that personal holiness is never the basis for answered prayer. His confession: “We aren’t asking you to answer our prayers because we are godly. Instead, we’re asking you to do it because you love us so much.” Daniel 9:18 (NIRV). How different are some of our prayers. “Lord, you know I’ve been following you and serving you faithfully for a while. So please answer this prayer!” The intention is good, but the basis is off centre. “Nothing in my hand I bring, simply to the cross I cling.” This is the perfect approach for our praying. God values our holiness, and holiness keeps the pathway clear. But always, only, our prayers are answered because God loves us so much. God has a schedule, and he calls it “the appointed time”—a phrase you’ll find throughout the Bible. Personal blessings, world events—on Heaven’s schedule. No doubt you have a schedule, too. No problem, unless your schedule and God’s schedule collide. Then, what will you do? Your schedule is impaired by impatience. You can hardly see tomorrow, let alone wait for it. That’s why trust in God is a life-changing strategy. It’s a prayer-changing strategy, too. “Lord, I want this, and I must have it now!” gives way to “I will be still as I wait patiently for the Lord. I put my trust in him, and in his schedule. I will live in his love as I wait.” Psalm 37:7; Isaiah 8:17; Jude 1:21. God has lots of free time, and his schedule is a joy. Will you enter the joy now? There are some smart people out there who define God as the pulsating energy of the universe, the mysterious force that fills the void of our speculations. Here’s my request. If there is a supernatural God, can we please let him speak for himself—instead of confining him to the limits of our natural intelligence? God has spoken for himself. He says to humanity, “Ask, search and knock. Then, you will receive, find and enter.” Matthew 7:7–8. Here is philosophy in a nutshell. God declares himself to us as real, personal, reaching out, inviting, connecting. The essence? Prayer! Ask, search, knock. Then you will receive, find, enter. When you pray in simplicity of faith, you are transformed for eternity by Almighty God. In some congregations there are one or two people tormented by a spirit of criticism. Sad, toxic personalities, consumed by something they perceive as wrong—usually a minor point of belief or behavior. Where we give grace, they dispense condemnation. Where we respond with the Gospel, they react with the law. Where we extend support, they demand control. One such person can keep a whole church on edge. The devil loves it—because it poisons the spirit of united prayer. In one fell swoop, the dark side dims the spiritual power of the church. But right here is our battle strategy! “Pray by the power of the Spirit. Pray all kinds of prayers.” Ephesians 6:18 (NIRV). Bring specific, united, bold and relentless prayer into the situation. Then stand by for the miracle that will soon take place. “Just say the word, and my servant will be healed.” Matthew 8:8 (NIRV). It’s one of the most sublime statements that fell on Jesus’ ears during his ministry. And it didn’t come from a theologian—it came from a military commander. “I was a nobody, but I prayed, and the LORD saved me from all my troubles.” Psalm 34:6 (CEV). Sublime words. “I was a nobody, but I prayed.” You might be unknown, alone, without status in the world. But through prayer you stand side-by-side with Almighty God, orchestrating plans and dispensing blessings around yourself and around our planet. “I was a nobody, but I prayed.” “Just me and God, but it was wonderful!” Let the extreme privilege of prayer elevate your day. Prayer is not only a way to talk intimately with God. It’s also a way to talk honestly with ourselves. “Why are you depressed, O my soul? Why are you upset? Wait for God! For I will again give thanks to my God for his saving intervention.” Psalm 42:5 (NET). Look at who the psalmist is talking to—his deep, inner self. First, he is real about his discouragement. Then, he speaks Heaven’s solution into his own life. This is not incidental—the same words repeat in verse 11, and in verse 5 of the next psalm. This is encouraging. When we’re down, we can use God’s gift of prayer to go out of ourselves and talk to ourselves as God himself would talk with us! Let’s enter the mystery—God’s Spirit in partnership with our spirit. 1 Corinthians 2:6–16. #39: Why hasn’t it worked out so good? “We prayed about this, so why hasn’t it worked out so good?” Common question. Jesus prayed about things, too. Before he chose his disciples, he spent a night in prayer. The first disciple he chose was Peter, who denied him in crisis. The last one he chose was Judas, and we know how that worked out. Here’s the thing about the gift of prayer. It’s not a magic wand or lucky charm that transforms life into a picnic and makes everything turn out just fine. By contrast, it’s our weapon in a war where many battles are won and some are lost—but in which final victory is guaranteed. Ephesians 6:18–20. Keep trusting. Don’t second-guess outcomes along the way. The big outcome is secure. So keep on praying, with praise to God no matter what. Ever prayed that God would do lots of miracles around you, so people would be compelled to repent and believe? Here’s irony. In towns where Jesus did most miracles, the people did not turn from their sins. Matthew 11:20. The majority said “That’s nice,” and carried on with their unchanged lives. Let’s pray deeper prayers! Pray that we would love people unselfishly. That we would live in the harvest with the witness of our changed lives. That we would receive the baptism and gifting of God’s Spirit. These are the things Jesus says will lead those around us into repentance and faith.